The killing of top Taliban commander Mullah Dadullah, a one-legged fighter who orchestrated a rash of suicide attacks, beheadings and an ethnic massacre, marks a major victory for the U.S. campaign. As victims of Dadullah's brutality celebrated the announcement of his death Sunday, analysts called the killing the most significant Taliban loss since the 2001 U.S.-led invasion, though one that would have little long-term impact after a new militant leader fills Dadullah's role. Dadullah, a top lieutenant of Taliban leader Mullah Omar, was killed in the southern province of Helmand during a U.S.-led operation that also involved NATO and Afghan troops, NATO's International Security Assistance Force said. Kandahar Gov. Asadullah Khalid, who called Dadullah a "brutal and cruel commander" showed the body to reporters in Kandahar who saw a one-legged corpse with bullet wounds to the head, chest and stomach. Qari Yousef Ahmadi, a purported Taliban spokesman, denied that the Taliban commander had been killed, but there appeared little doubt Dadullah was dead. Dadullah is the second top-tier Taliban field commander to be killed in the last six months, after a U.S. airstrike killed Mullah Akhtar Mohammad Osmani in December. Dadullah, Osmani and policy-maker Mullah Obaidullah had been considered Omar's top three leaders. Rahimullah Yusufzai, a Peshawar-based editor for the Pakistani newspaper The News and an expert on the Taliban, said Dadullah's death was "the biggest loss for the Taliban in the last six years." But he noted that even though the Taliban were demoralized after Osmani's death in December, they quickly resumed attacks. "I don't think they can find someone as daring and as important as Dadullah," Yusufzai said. "I think maybe temporarily some of their big operations will be disrupted, but I don't think it will have a long-term effect." Mustafa Alani, director of security and terrorism studies at the Dubai-based Gulf Research Center, said insurgent attacks in Iraq did not abate after the killing of al-Qaida's leader in Iraq, Abu Musab al-Zarqawi, last June. "In this sort of organization, people are replaceable, and always there is a second layer, third layer. They will graduate to the leadership," Alani said. "He is important, no doubt about it. Yes, it is a moral victory, but he's replaceable." Still, Dadullah's particular brand of cruelty was unmatched inside the Taliban. Dadullah's men videotaped beheadings of Afghans suspected of cooperating with international forces or the Afghan government, and the suicide bombers he is believed to have commanded have killed or injured hundreds of Afghan civilians, soldiers and police, as well as dozens of international forces. In 1999 he led a Taliban massacre of ethnic Hazaras in the province of Bamiyan, where the Taliban in 2000 destroyed two large, ancient Buddha statues carved into a hillside cliff. "This morning a friend told me that Dadullah had been killed and I wanted to shout out to the people 'Congratulations! Congratulations!' I was so happy I started crying," said Munir Naqshbandi, brother of Afghan journalist Ajmal Naqshbandi, who was believed to have been kidnapped and beheaded by Dadullah's men last month. "Dadullah was a cancer on the body of the Afghan people. It is good news for all the people of Afghanistan, not just the Naqshbandi family," he said. The Taliban's former ambassador to Pakistan, Abdul Salam Zaeef, said Dadullah's death would create more violence and will likely motivate supporters to take up arms in revenge. He said negotiations were the only way to end the insurgency, echoing a call by Afghanistan's upper house of parliament this week for talks with Afghan Taliban fighters. "When they are killing one Mullah Dadullah, they are creating 10 more," Zaeef said. "Killing is not the solution in Afghanistan." Yusufzai said many Taliban fighters had been unhappy with Dadullah, saying he maligned the militant group with his brutal beheadings, a rash of kidnappings and boastful videos that starred himself shooting weapons and walking in Afghanistan's mountains. "They thought he had become too big for his shoes," Yusufzai said. NATO said Dadullah moved into Afghanistan from his "sanctuary" a reference to Pakistan _ where he trained suicide bombers. Pakistani President Pervez Musharraf admitted in February that Dadullah had been in Pakistan several times and eluded capture. Dadullah "will most certainly be replaced in time, but the insurgency has received a serious blow," NATO said. The Defense Ministry spokesman, Gen. Mohammad Zahir Azimi, said Dadullah was killed in the Sangin area of Helmand province, a region that has seen heavy fighting in recent weeks and where airstrikes on Tuesday killed between 20 and 40 civilians, according to Afghan officials and villagers, the latest in a series of civilian deaths that has weakened support for the international mission. Azimi said Dadullah was killed Friday,though the intelligence service and Kandahar governor said he died Saturday. He said Dadullah died in a shootout alongside 10 other fighters, and that military officials had reports that Dadullah may have been at the battle site but weren't positive the information was true. An ethnic Pashtun, the group that makes up the core of the Taliban and is prominent in eastern and southern Afghanistan, Dadullah lost a leg fighting against the Soviet army that occupied Afghanistan in the 1980s. He emerged as a Taliban commander during its fight against the Northern Alliance in northern Afghanistan during the 1990s, helping the hard-line militia to capture the city of Mazar-e-Sharif. 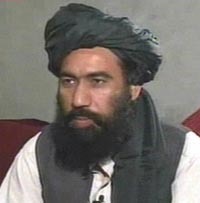 Since the Taliban's ouster in late 2001, Dadullah emerged as the group's most prominent and feared commander. He often appeared in videos and media interviews, and earlier this year predicted a militant spring offensive that has failed to materialize. In March, Britain's Channel 4 television aired an interview in which Dadullah said al-Qaida leader Osama bin Laden was alive and well and in contact with Taliban officers.